There is an incredible variety of potatoes from around the world – literally thousands of them. Different varieties of potatoes vary in texture. They can be starchy, waxy, or somewhere in-between. Some potatoes are great for mashing while others work best if baked or roasted. At the grocery store there are usually signs above the potatoes that will tell you which ones are great for baking versus which ones are better for mashing. Some potatoes are described as “all-purpose” which means you can cook them any way you want. What’s common to all potatoes is that they’re incredibly versatile and nutritious. They contain iron, Vitamin C, potassium and starch. Sweet potatoes – which are actually a very distant relative of regular potatoes – are loaded with Vitamin A, C and B6. In general, potatoes can be boiled, baked, steamed, microwaved, and used in salads, soups and stews. 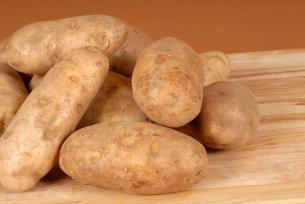 Russet or Idaho potatoes have a starchy texture that works well for baking. Starchy Potatoes (aka baking potatoes) are good to use for baking, French fries and mashing. They tend to come apart when cooked, so they’re not great for dishes like Potato Hash. Small, round new potatoes taste great boiled. These potatoes fall somewhere between starchy and waxy, so they work in most recipes. Some examples: Viking, All blue, Kennebec, Carlton, Yukon Gold, Norland Red, Purple Majesty. Sweet potatoes are often referred to as “yams” in the United States. Strictly speaking, they are not the same thing (not even related!). True yams are typically grown in parts of Africa, Asia, Latin America and the Caribbean – they are often brown or black, and can grow to be several feet long. 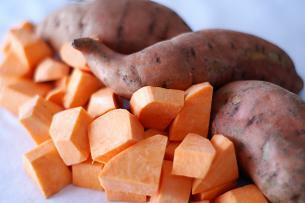 Follow the same guidelines for buying and storing sweet potatoes as you would other potatoes. Sweet potatoes are often baked in their skins, or used to make sweet potato fries. 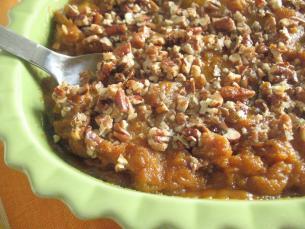 There’s also the Thanksgiving classic, Sweet Potato Casserole (shown below), which is often topped with marshmallows! Look for potatoes that are unblemished and don’t have a green tinge. A greenish skin color signals that the potato has had too much exposure to light. These potatoes may actually taste bitter and cause digestive (and other) problems. If the potato is only partially green, you can remove the green part and use the rest. 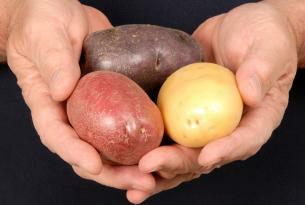 The worst place to store potatoes is in the fridge – this affects their taste and color. They should be kept in a cool, dark and dry place (not under the kitchen sink), and away from onions. If stored at room temperature, they’ll last about a week. If stored between 45 and 50F (7 to 10C), they’ll last several weeks. It’s better to store potatoes in a paper bag or cardboard box than in a plastic bag. Pre-washed potatoes will spoil more quickly than unwashed. If you’ve had some potatoes around for a while, you may notice that they start to sprout. According to the National Potato Council, this means that they’re being stored at too high a temperature. You can still use them – just cut the sprouts off. Wash them under running water, scrubbing the surface of the skin with a brush, or vigorously with your hands. Don’t use soap, though. Depending on how you’re using potatoes, you may want to peel them. 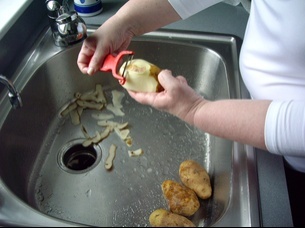 If you want to remove the skin before cooking, simply use a vegetable peeler and peel from one end of the potato to the other. If you don’t like peeling, you can also remove the skin of a potato after boiling it. In this method, cut a shallow slit around the middle of the uncooked potato, and then boil it. 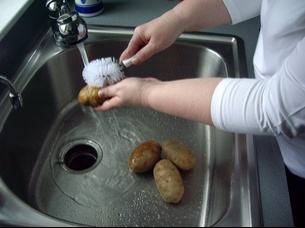 After boiling, dunk the potato in ice water for a few seconds. When it’s cool enough to touch, it will be very easy to pull the skin off. The potato is then ready for mashing or using in a recipe. For The Love of Cooking has about 40 different potato recipes! Pioneer Woman shows us a twist on baked potatoes by demonstrating a great recipe created by Australian food writer Jill Dupleix, called Crash Hot Potatoes. Hi there, thanks for all the great info on potatoes. I’m just curious about why they shouldn’t be stored next to onions. I just put up a hanging basket and have my potatoes in the bottom and the onions in the middle basket right above them. It is really not an issue for those of us who shop each week and resupply the decorative baskets full of potatoes and onions. If you are cutting lots of potatoes into slices I would recommend buying a V-Slicer. I have had mine for years and there is nothing like it for thin, even slicing. Thanks Kathy, that definitely clears it up! How long can you keep raw sliced potatoes before cooking? When I was small, my Mom would get the potatoes ready before going to work by peeling them and putting them in a bowl of cold water in the refrigerator. The potatoes must be totally covered with the water or they will turn black. 8 hours later they were fine to put into a pot and cover with fresh water and start cooking them. Any more time than that is probably pushing it! Leftover baked sweet potato should be eaten with in a day or two of baking. The skin is going to get really soggy in the refrigerator. The potato will taste better scraped out of the skin and re-heated. PS. As with all leftovers…when in doubt, throw it out! Hiya, I was wonder about a recipe for cooking sliced potatoes in a skillet, everytime I’ve tried they would turn into half mush or get stuck to the pan. I do not have a specific recipe for skillet potatoes. If you google it there are many options to choose from. Some recipes have you par-boil the potatoes first, but I prefer to just put them in a fairly hot non-stick pan with about 3-4 tablespoons of vegetable oil. Once they develop a fair bit of color, turn the temperature down and continue cooking until they are soft in the center. In recent years, I find that the regular white potatoes I buy are rather sweet, no matter the type of the potato. Read an article that stated when potatoes are stored in the refrigerater or in a very cold envirement, potatoes turn sweet. I would like to buy a white potato that tastes like a regular potato, any suggestions? Potatoes are actually not supposed to be stored in the refrigerator. They should be kept in a cool, dry place away from direct sunlight. 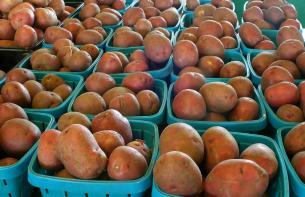 Have you tried buying potatoes from a local farm stand? I’m pretty sure they will have never been exposed to refrigeration.